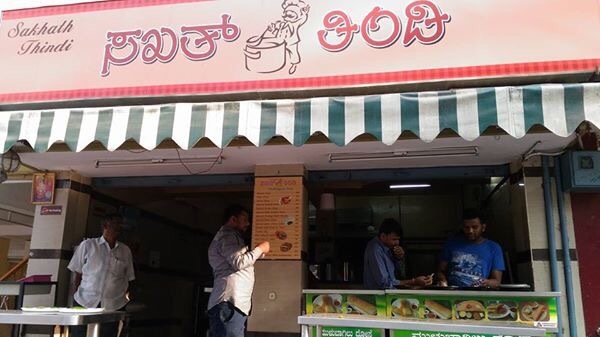 Sakhath Tindi – An unidentified gem kind of a place for people who would like to try Dosa in different forms at Namma Basavanagudi. Origin: It started by an Arya Vysya family in a place called Mulbagal (80 kms from Bangalore). That place is a hub for travellers towards Tirupathi including me. How different from regular Dosas? 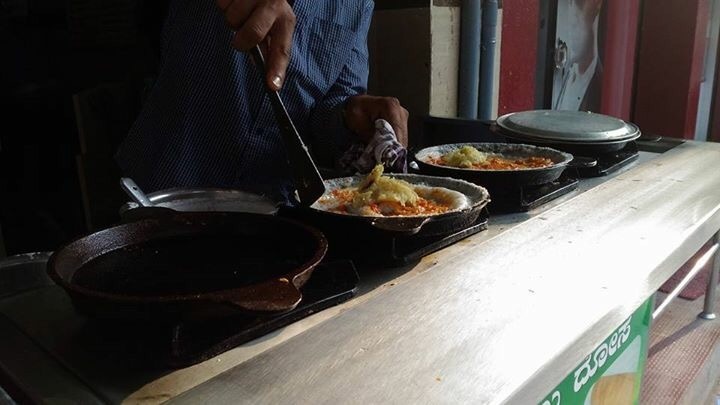 Well, The Dosa Tawa which they use is the ones used at home made using cast iron. When they put batter, it will be spread across corners and forms a thin Crispy layer. 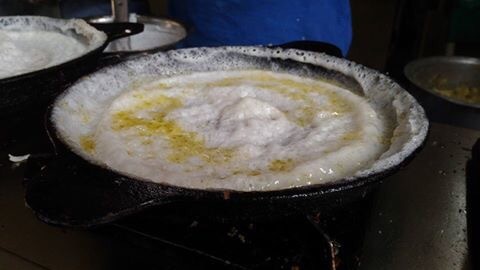 They put lot of oil/Ghee, depending on the type of dosa you choose. Usually for Special Dosas, they use Ghee. Once it’s ready on the Tawa, the Dosa will be crispy one side & another side fluffy like Khali Dosa. The Dosa will be roasted only one side. Chutney? Since Arya Vysya Community base is from Andhra Pradesh & Telangana, some of the house holds still have habit of using groundnuts for Chutney preparation. However, these people blend Channa Dal & Groundnut along with Coconut for Chutney preparation to suite Bangaloreans Palate. The taste of the Chutney is out of the world. What all Dosas we get? 1. 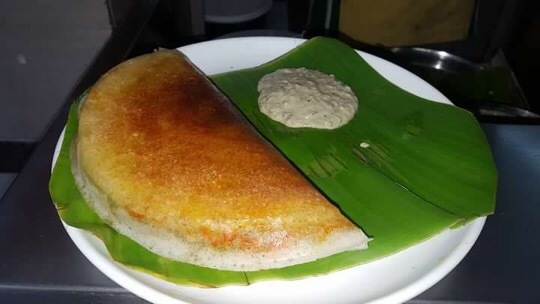 Masala Dosa – The Dosa will be prepared by the way I mentioned above. However they put red chilly & garlic Chutney with Aloo Palya on the fluffy side. 2. Bath Masala Dosa – They spread yellow coloured lemon rice on the above mentioned Masala Dosa along with aloo palya. Few people might not appreciate since it’s not so popular. However, it’s common practice in most of the towns in & around Mulbagal. 3. 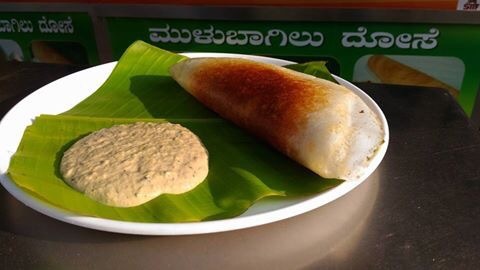 Onion Dosa – The Preparation is similar to other restaurants in Bangalore. However, they put lot of Ghee, onions, and chopped green chillies, believe me it’s best. 4. Mossaru Kodbele- Typical Arya Vysya home evening snack is available here. Prepared using curds and rice dough and is served with chutney. It is out of the world. I had been to the Sakhath Thindi multiple times & totally enjoyed. They are consistent from the time I am visiting. 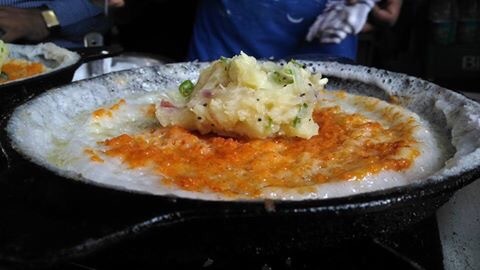 Though Sakhath Thindi is not part of the legendary restaurants list. Still their quality & taste certainly equal. The original Mulbagal Dosa restaurant by name “Lakshmi Tiffin Center” is definitely a Nostalgic place for me. Ambiance: The Place looks more like a Darshini with no much decor. Patrons should stand & eat. I never seen people complaining about seating. Not many people aware of this place, so hardly any crowd. Overall, Good Place for Breakfast & Evening Snacks. Address: Sakhath Thindi, 170, Subbarama Chetty Road, Netkallappa Circle, Basavanagudi, Bangalore. Next Post The Amazing Escape…. Unlock the Mystery! Mouth watering sodas! We are also fan of Bangalore sodas. Sir, Thanks for giving typical Namma Bangalore Dosa information.